The Franklin State Forest is one of three DCR land holdings that make up the F Gilbert Hills State Forest. It's 883 acres are laced a few doubletracks and many miles of interesting singletracks. Due to a recent acquisition, the southern boundary now abuts the Southern New England Trunkline Trail. The SNETT is a national multi use recreation trail that runs from Franklin MA to Willimantic Ct. The 85 mile `rail trail' is open to bicycles and other trail users. But back to Franklin. This forest is, by the standards of Southeastern Massachusetts, very remote. Few people have ever explored the Franklin State Forest. But those who have have discovered a vast aray of increasingly technical singletracks. Franklin is a FUN ride, but you will have to work. The best place to start is where a powerline crosses Forge Hill Road in Franklin MA. This is about 100 yards from the Franklin YMCA parking lot. 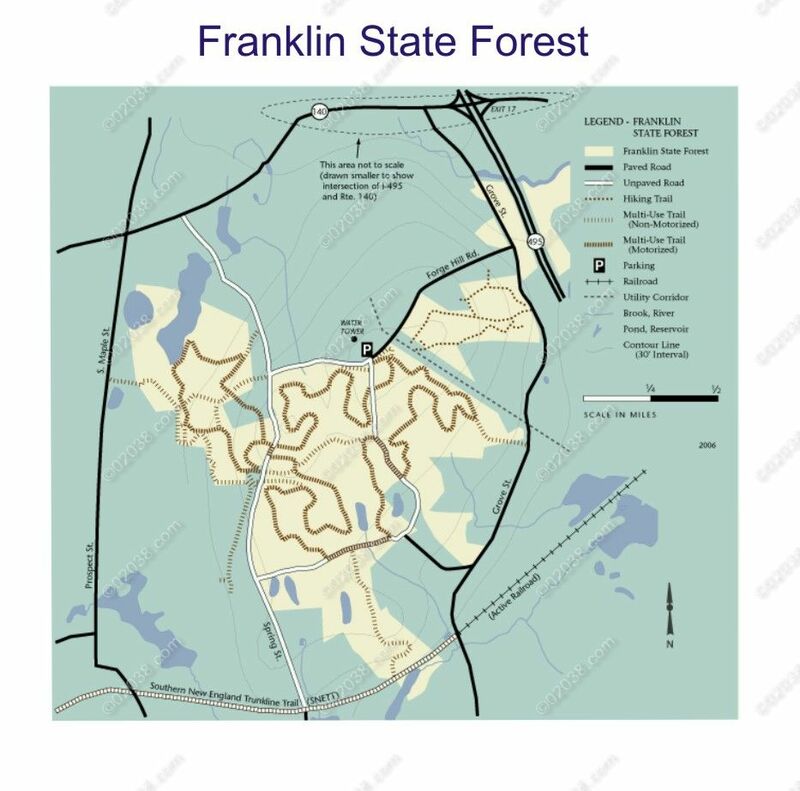 Franklin State Forest is located on both sides of the powerline. The whole forest is laced with trails. But the most, and the best, (purely a subjective opinion), are on the `right' side of the powerline. I would strongly suggest that you bring a local road map, as trails have a way of leading to other trails and you may never know just when you've become lost. Over the years many of Franklin's trails have become muddy and rutted from illegal off road vehicle use. Consequently the best time to ride here is when it has been dry for a while. One of my favorite trails, is a singletrack that bounces through the woods, crosses three old woods roads and slolomons around about three million trees while making its way down and around a long mildly sloping hill. It's 8.6 miles long, very technical, and `feels' like its all down hill. Wow! What a gas! But it leads out of the forest. And without a map your only way back `in' is back up that same hill. Oooof! With a map it's a short trip back on a dirt road. Hmmmm! Does this sound like a good place to do a few intervals? Another trail, similar to the one just described, but shorter and even more technical, intersects the SNETT. But which way do you go from there? Choose wrong and it's 26 miles to the Douglas State Forest. A bad choice indeed. The current DCR forest map is not that good. But fortunately they're working on a better one. The best published map is in the latest edition of Stuart Johnstone's Mountain Biking Near Boston. Another neat thing about Franklin. I mentioned the forest's isolation. Well, while it's true that you'll almost never meet anyone else on the trails. Franklin State Forest is not exactly isolated. It's only about 1/2 mile from Rt. 495 and and sort of in the middle of a Boston Providence Worcester triangle. So frankly speaking there's really no reason to not ride in Franklin. Early Spring will find Franklin's singletracks quite muddy. But the trails are fine for riding by the middle of May. To get there, take exit 17 from Rt. 495. Head west and take your first left. This is Grove St. Go for 1/2 mile and turn right on Forge Hill Rd. Go up the hill till you see the powrline and the YMCA. Park at the side of the road and explore.